One of Nissan's most popular vehicles, the Maxima brings along a hefty engine, an all-new package of safety features, and slightly new looks for 2019. Let's dive deep into what's new on the 2019 Nissan Maxima, how big its engine is, and what's new in the safety department for the so-called "four-door sports car." What are the Trims & Features on the 2019 Maxima? This year's Nissan Maxima comes in six trim levels: S, SV, SL, SR, Platinum, and Platinum Reserve. 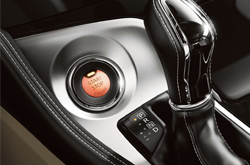 The lowest level on the proverbial totem pole, the S trim includes keyless ignition, a five-inch display for navigating radio stations, CDs, and libraries of songs and videos on smartphones and computers. This package also includes a USB port, easy-breezy cruise control, and automatic headlights. Further, the S model includes Apple Carplay, Android Auto, and a sound system with eight speakers spread ideally throughout the car to provide a quality listening experience. The SV model is a step above the S-trim Nissan Maxima, featuring things like the latest voice recognition software via Siri Eyes Free, a rear-view camera to make backing up both easier and safer. Fog Lights, a sport suspension setup, paddle shifter, and a spoiler are also included. 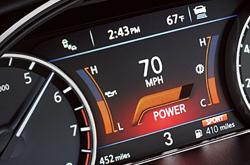 The 2019 Nissan Maxima SL comes with a Bose audio system with 11 speakers, a quick-to-work heated steering wheel, a two-panel moonroof, and a sonar system in both the front and rear of the vehicle to help prevent accidents. Next up is the SR trim package, including top-of-the-line ascot leather seats with relaxing, plush Alcantara seat inserts. This model includes paddle shifters, providing the experience of driving a car with a manual transmission without all the gear-shifting problems. 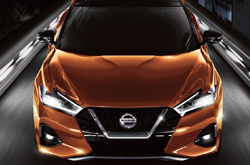 The 2019 Maxima detects people and animals that are nearby with its Pedestrian Detection feature, paired with Automatic Emergency Braking to increase the likelihood of returning home scot-free. This vehicle also includes upgraded wheels from the previous three models, sporting 19-inch, glossy black wheels made of an aluminum alloy. Next-to-last on this year's lineup of models is the 2019 Nissan Maxima Platinum. This package includes the ability of the car's computer to remember the position of the driver-side seat, rear-view mirrors, and the steering wheel. Also included are different rims from all other models, as well as a complimentary trial to SiriusXM satellite radio. The Platinum Reserve model features heated rear seats, a dark grey headliner, and an interior trim differing from all other 2019 trims. All models of the 2019 Nissan Maxima include a 300-horsepower, 24-valve, V6 engine. The Maxima averages 20 miles per gallon (MPG) in stop-and-go city traffic and upwards of 30 MPG on highways. This year's Maxima provides 261 lb-ft of torque at a respectable 4,400 revolutions per minute. The 2019 Nissan Maxima is also equipped with a continuously variable valve timing control system (CVTCS) on both the exhaust and the intake valves. It effectively increases vehicle performance and fuel efficiency. One of the most innovative safety features on this year's rendition of the Nissan Maxima is Safety Shield 360. This all-inclusive package includes the following features: Automatic high-beam headlights, warnings when the driver exceeds the boundaries of their lane, blind-spot vehicle detection system, automatic emergency braking, an alert for fast-moving, lane-changing drivers behind the vehicle, and auto rear braking. An all-around, 360-degree camera is included in certain models. Paired with Safety Shield 360, the 2019 Nissan Maxima will be one of Nissan's best annual renditions in years. 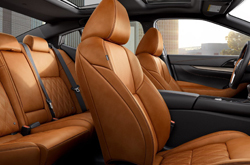 Come into our Nissan dealership in Frisco, TX and take a test drive of the 2019 Nissan Maxima.